“Metabolism, the City of the Future” is a rare opportunity to delve into a wealth of archive on an architectural movement, which, born over half a century ago, continues to influence architecture and design all over the world. 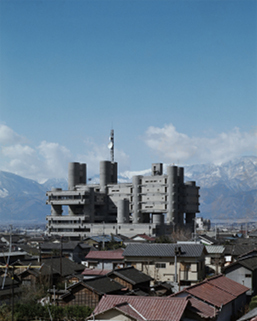 An eclectic group of visionary architects and designers, the Metabolists emerged out of the post-war period of reconstruction and economic growth of Sixties Japan. With over five hundred exhibits from around eighty projects, Mori Art Museum really is filled to the brim with a vast collection of models, drawings, photographs and old film footage, much of which has never been seen in public before. On top of this are recently recorded interviews with some of the Metabolists still living, as well as newly commissioned state of the art 3D computer graphics which breath new life into their ambitious architectural dreams. To wander through this treasure trove is to be inspired by visions of fantastical future cities and superstructures of mythical proportions. It is also a journey of discovery as the exhibit traces the journey of Metabolism from its inception at the World Design Conference in 1960 through to present day worldwide projects. The quirky tower of life-sized Lego blocks (a.k.a. the Nakagin Capsule Tower) of which I am rather fond, was the brainchild of one of the most influential members of the movement, Kisho Kurokawa. Far from being a mere architectural folly, its eccentric design is highly functional. Each Lego block is a self-contained residential unit, which can be added or subtracted when required, allowing the tower to grown organically and adjust to the residents’ needs. Be sure to go and see one of the original capsules on display on Roppongi-dori. In a room dedicated to architecture of a different nature, under the title of “Symbolic Spaces” photographs and models of a handful of fiercely modern and imposing concrete structures invoke a fearful kind of delight. These are buildings rooted in traditional Japanese forms generally reserved for wood and kept to a smaller, more human scale. Refashioned in concrete to giant proportions, the effect is quite stupefying. On the one hand it can bring delights such as the National Stadium in Yoyogi, designed by Kenzo Tange; on the other, rather out-of-place oddities. Kiyonori Kikutake’s Hotel Tokoen for example — a cross between a temple and a concrete office block — or the imposing Civic Center he designed in Miyakonojo with its giant bellows-like roof. Besides living spaces and public buildings, the Metabolists also created numerous proposals for cities and agricultural communities, though many of these plans were to remain on paper or in model form only. However, with the help of newly commissioned 3D computer graphics created by Digital Hollywood University especially for the exhibition, these spellbinding visions are quite literally taken to a new dimension. Projected onto movie screen size, you may want to sit down as you are taken on a giddy magical carpet ride through the floating cities of Kenzo Tange’s vision for Tokyo Bay, or fly up and over the gigantic apartment blocks of Arata Isozaki’s Shibuya. Sprouting up like enormous concrete trees, from a distance they have an ominous presence. But zoom in closer and each concrete ‘leaf’ becomes an apartment capsule, and there’s room for plenty more on the huge branches. 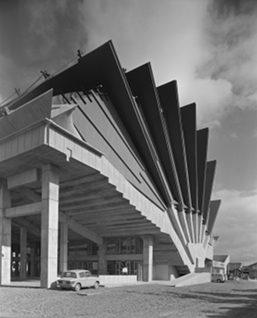 The 1970 Expo in Osaka provided the Metabolists with a unique opportunity to showcase their ideas and designs in one area. Expanding now into interior design and art also, their imprint on the Expo was substantial, and the exhibition once more excels in bringing together a delightful selection of memorabilia. The exhibition comes to an end with a look at more recent and ongoing larger scale city projects around the world. Decades after their original conception, Kisho Kurokawa and Arata Isozaki seem to have finally found, in Zhengdong New Town in China, a place for their grander visions to become real. It also goes without saying that in light of the destruction caused by the Tohoku earthquake and tsunami, the timing of this exhibition, though entirely coincidental, is nonetheless, quite uncanny. “Metabolism, the City of the Future” is a timely reappraisal of a fascinating collaboration of visionary architects and designers whose past dreams and visions continue to inspire and command our attention.